It’s often said that numbers don’t lie. While that may be the case, I can attest that they don’t always tell the full story either, especially when it comes to Enactus team projects. As the Vice President of Enactus USA Programs, one of my responsibilities is auditing the National Champion teams. This process is used throughout our organization to verify team statistics and assess project impact and sustainability. Numbers like those from Belmont University Enactus, this year’s World Cup Champion: 42 students, 2,442 volunteer hours and 14 projects that benefit local communities as well as others around the world – all impressive figures that speak to the reach of their efforts. However, it was the part of the audit where I got to conduct interviews with actual participants and project beneficiaries that the true scope of seeing possibilities and putting talents to work really came to light. Belmont’s leading project, Spring Back Recycling, involved developing a business plan and operating strategy for a used mattress recycling venture. Through the program, previously incarcerated and homeless workers are taught valuable skills while employed at a facility where mattresses are dismantled and their materials recycled for use in new products. 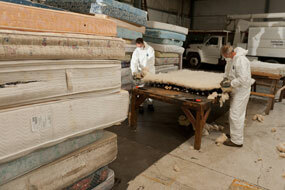 Since its inception, more than 15,000 mattresses have been recycled and 250 tons of waste saved from landfills. But it was hearing two project participants speak about no longer having to live in tents as a result of this effort, learning that one man is now going to college and that he is hopeful of a better future and how students are forever changed by helping others that made me appreciate the full measure of the project’s impact. It is the human element, the real lives improved by these projects that simply can’t be appreciated with statistics alone. Learn more about the Spring Back Recycling project at www.springbackrecycling.com.